Our promise to you – We’ll show up when we say we will and we’ll clean-up before we leave. We know maintaining a home and caring for a family is a 24/7 job. The Jackson family would love to offer our expert care with any St. Louis area tree service needs you may have, from trimming and tree cutting to tree removal and stump grinding. Showing up when we say and cleaning up before we leave is our promises to you. The external care and appearance of a commercial property is often the first impression people get of your company. We offer both preventative tree service and tree cutting and ongoing maintenance and pruning of trees, lawns, landscapes, parks, building campuses, and other public or commercial properties all over the St. Louis metro area. Get a close up look while our professional tree removal team brings a big one down. When we take on a project, we provide two crucial things: great service and expert knowledge. It’s these guarantees that have earned us recognition as one of the leading St. Louis area tree services. Scroll down to learn about some of our awards and credentials. Certification by the International Association of Arboriculture (ISA) is one of the highest achievements for professionals in the tree care industry. When you work with an ISA-certified arborist, you know you’re getting expert help that only the most experienced tree services can give. What’s more? Jackson Tree Service has not one, but two certified arborists. You can check out Mike and Rachel’s ISA profiles by searching for them here. To learn more about what it means to be ISA certified, click here. 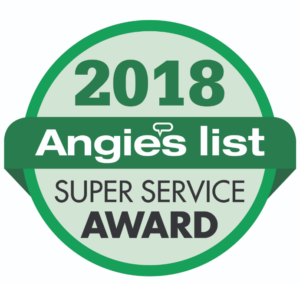 In 2018, we were recognized with an Angie’s List Super Service Award. As an award that only goes to businesses that maintain superior reviews and ratings on Angie’s List, we were incredibly proud to be considered among a pool of best-in-class providers. Through years of dedication in the tree care and removal industry, we’ve honed our customer-service and expertise, and we are thrilled that our customers recognize our high quality of work. No job is too big or too small for Jackson Tree Service, a family-owned company with deep roots in the St. Louis, Missouri, community. We were established in 1960 and have been led by three consecutive generations of the Jackson family. Our founder, Lawrence Jackson, started the business equipped with little more than a chainsaw and a truck. But, as his family grew, so did Jackson Tree Service, quickly developing a reputation as an ethical company that always provides quality work at an affordable price. We are experts at tree trimming, tree removal, deadwooding, stump grinding, brush clearing, and tree fertilizing, and each service is always performed in a safe and efficient manner by knowledgeable professionals. Also, Jackson Tree Service is fully insured for your protection and gladly provides complimentary estimates for both residential and commercial projects of any size. Tree trimming and tree removal both require highly specialized skills and careful planning. Putting these projects in the hands of an unqualified individual or company can have disastrous consequences. It is dangerous work, and if not done properly, the well-being of your trees and even the structural integrity of your house can be put at risk, as falling limbs can cause serious damage. This is why your tree care needs should always been handled by a company like Jackson Tree Service. Tree care isn’t just a way for us to make a living; for decades, it has been part of our family’s identity. We are one of the longest-tenured tree service companies serving St. Louis, MO, and the surrounding area, and we’re ready to put our expertise to work in handling all of your necessary tree work. Jackson Tree Service has a reputation for always doing an amazing job – and for good reason. In addition to having highly experienced individuals on staff, including arborists, we are skilled in the operation of various types of heavy equipment that allow us to complete bigger jobs faster and more cost effectively. Plus, at Jackson Tree Service, we thoroughly clean up after ourselves at the completion of each project. Whether we are hired for the purposes of tree trimming, tree removal, tree stump grinding, or a similar service, we never consider the job done until a thorough cleanup has been performed and the customer has provided his or her approval. Residents of St. Louis, MO, and nearby suburbs will also be pleased to know that Jackson Tree Service is available outside of regular business hours in case of an emergency. Day or night, seven days a week, we answer the phone and do our best to promptly address any emergencies that happen to arise involving trees. After-hours availability for help with bona fide emergencies is yet another reason why Jackson Tree Service has been able to establish itself as one of the premier providers of both residential and commercial tree services in the area. To request a quote for tree trimming, tree removal, or any of the other services we provide, contact Jackson Tree Service. Our service area includes St. Louis, MO, and the west-central suburbs.